SpeechPathology.com – ever heard of it? Maybe you have. I see their ads in my Facebook feed. Or in emails I didn’t realize I signed up for at an ASHA convention. But this one…this one is worth clicking on. SpeechPathology.com is “a recognized leader in online professional development and career center resources for Speech Language Pathologists and SLPAs worldwide.” AKA you can sit in your pajamas or on the beach and earn ASHA approved CEUs. They offer professional development courses via video, audio, or text transcriptions. They hire practicing SLPs across the Nation who specialize in a given topic, record the session, and offer the courses available live or at your own leisure. What does this mean for soon-to-be (and current) SLP Graduate Students? You can access 500+ courses given by leading SLP experts, attend/re-watch virtual conferences and symposiums, and access weekly live seminars. I am all for reading research and staying current, but sometimes one article takes me a few hours. Ever since I purchased my subscription, I’ve watched over 20+ hours of a variety of course topics that I never made time to learn about before. For those starting an SLP grad school or in the middle of it, the courses offered allow you to explore topics you have a high interest in but may not get the chance to take at your university. For example, before starting graduate school, I was really interested in dialects and multiculturalism. My only resource was a textbook I secretly bought on eBay. If I had this subscription, I would have watched one of the approximately 8 bazillion courses they have (that’s an estimate, folks). In case you are just rolling in the dough, they also have this new product called “SimuCase” that provides virtual patients with case studies. You can interact with and diagnose within the virtual interaction. I want to try out! I’ll let you know how it goes. 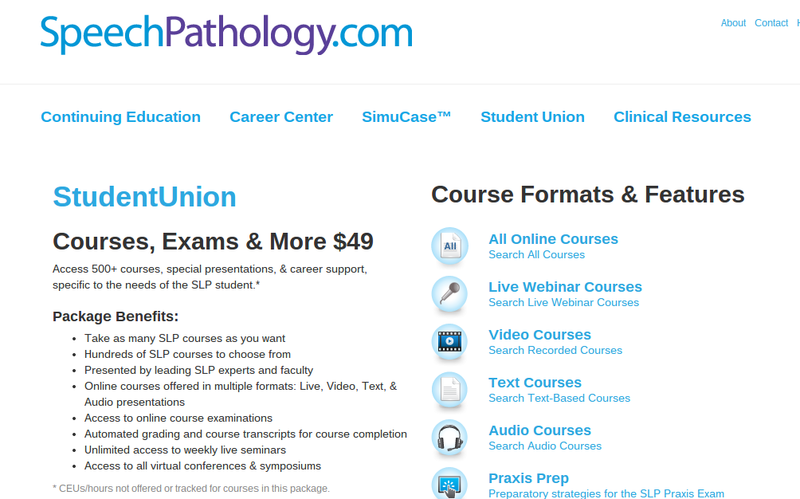 SpeechPathology.com has a “StudentUnion”, which is $49 per year. This is basically the same as the full subscription, except you can’t count any of the courses as CEUs. For $99 a year, you can count the credits towards CEUs for ASHA and state licensure/certification. The SimuCase is a separate subscription for $99 a year. I’d love to hear from others if they enjoy this as much as I do, or if you’ve had a different experience. Happy learning! I shared this post on Reddit and asked how others are spending their summer. Many people want to relax and enjoy the last months before the hectic-ness begins. An equally good decision!!! Random question: How do you weed through all of the courses to find the exact one you think you would find most helpful to the topic? I had no idea there was a student option. Thanks for sharing! For the SpeechPathology.com website, are there different levels of CEU course instruction? In other words, are there introductory courses? Intermediate and advanced? I don’t see an option for the ‘Student Union’, I searched all over the website but was unable to find it. Any tips?